The Owyhee Mountains of southwestern Idaho are like the proverbial blank spot on a map. The area is sparsely-inhabited and has a distinctly remote and wild feeling about it. 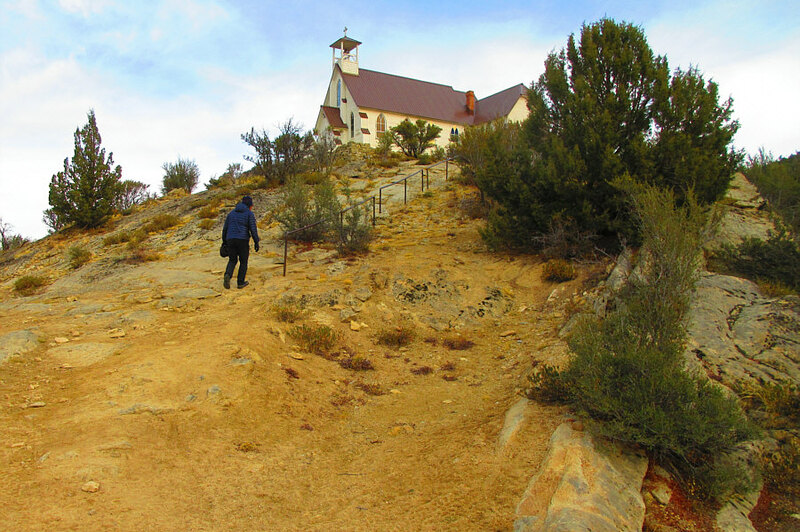 Zosia Zgolak and I made plans to hike up Hayden Peak, the highest point in the range, on 17 October 2017, and depending on how much daylight we had left, we also wanted to visit the local ghost town of Silver City. 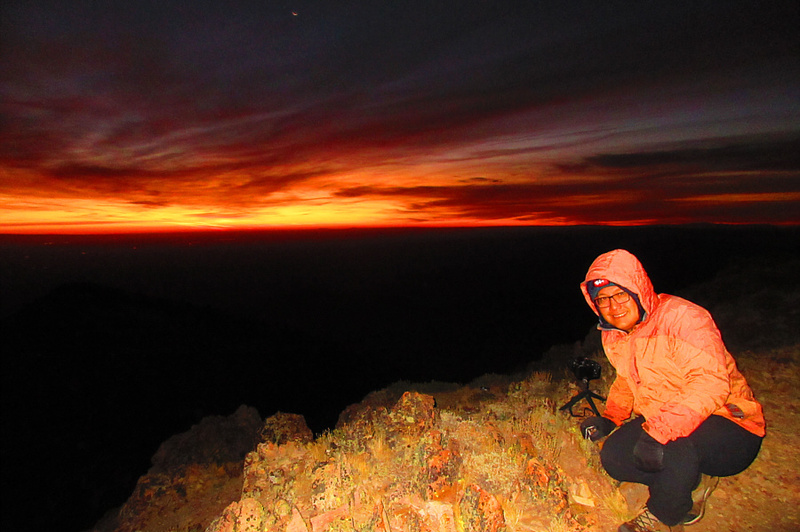 We referred to Tom Lopez's excellent book, Idaho: A Climbing Guide, for directions to climb Hayden Peak. The approach road (sometimes referred to as Lineham Flat Road) starts from Silver City Road about 800 metres east of Slaughterhouse Gulch (this is the T-intersection with the road that enters Silver City; there is an outhouse here) where Zosia and I had camped the previous night. The road turned out to be in such good condition that we actually ended up driving all the way to the summit! A work crew arrived shortly after us to service the communication installations at the top, and that may explain why the road was so well-maintained and drivable. 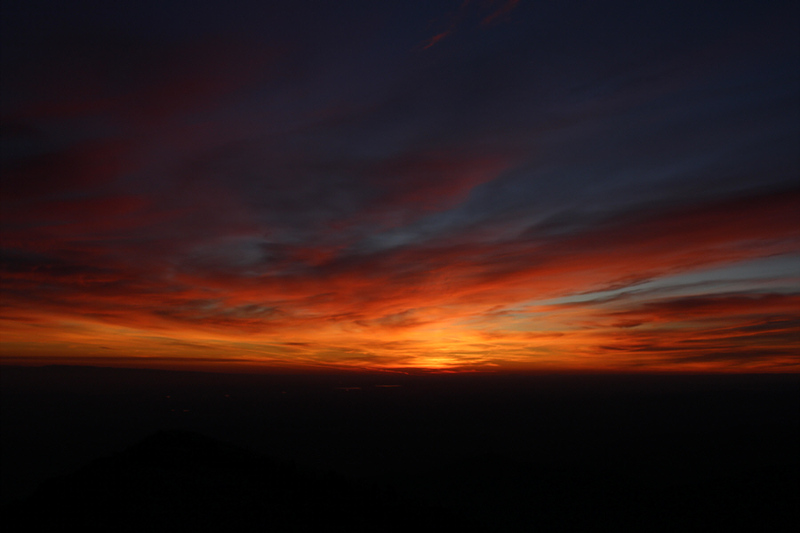 The work crew did not seem to mind our presence, but Zosia and I left anyway soon after we finished watching the sunrise. 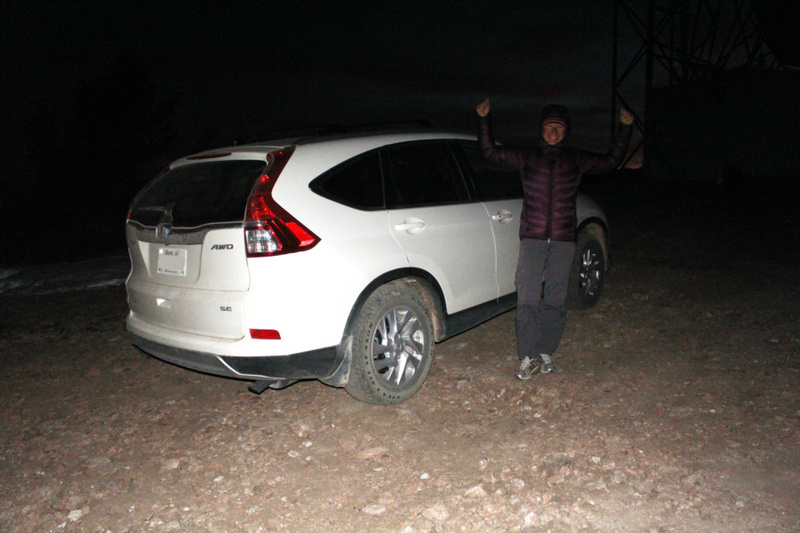 Zosia raises her arms in triumph after arriving at the summit of Hayden Peak (2561 metres) by car. Sonny sets his camera up to take some sunrise photos. 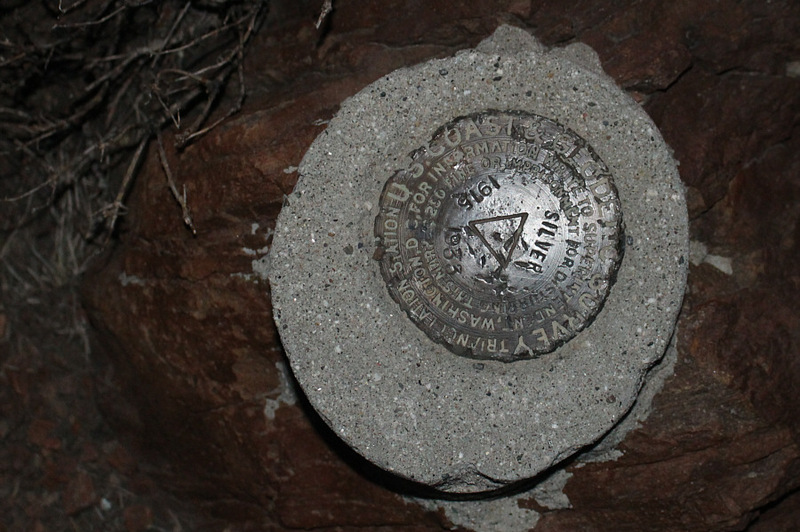 Here is the survey marker for the summit of Hayden Peak. 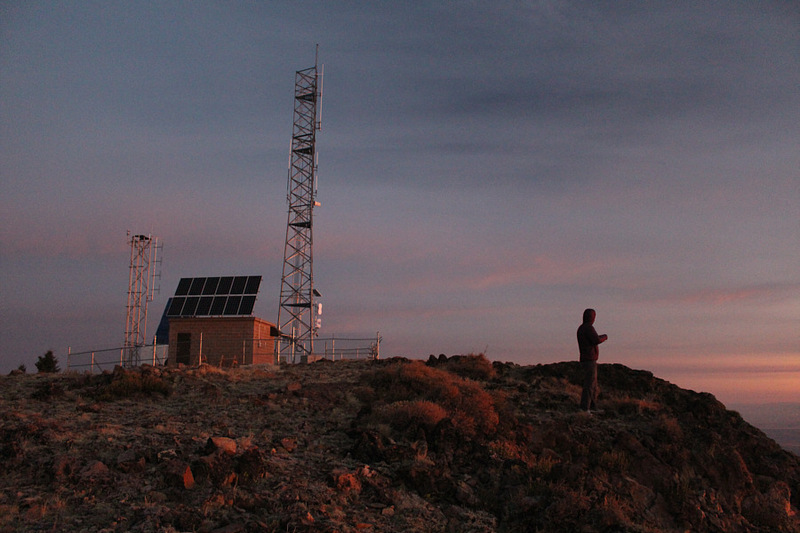 Communication installations clutter the summit of Hayden Peak. 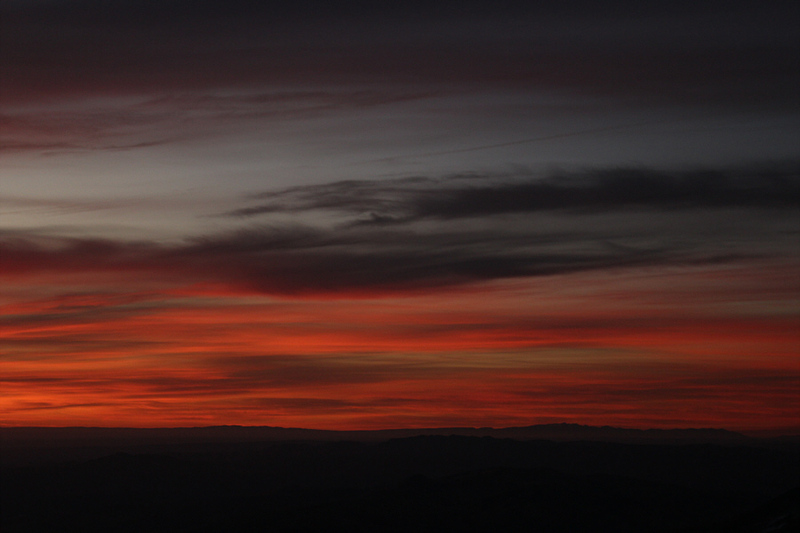 Clouds glow in the pre-dawn sky. 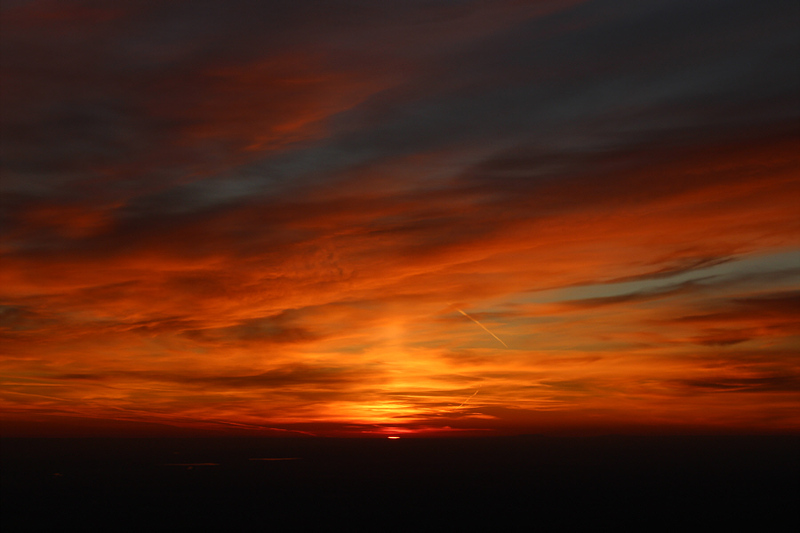 Different colours abound in the eastern sky. 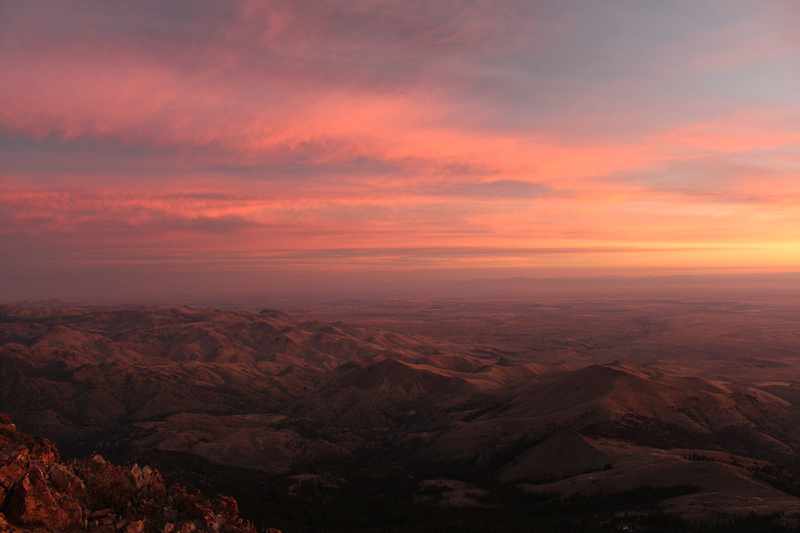 Idaho's Snake River Plain can be seen beyond the foothills north or Hayden Peak. 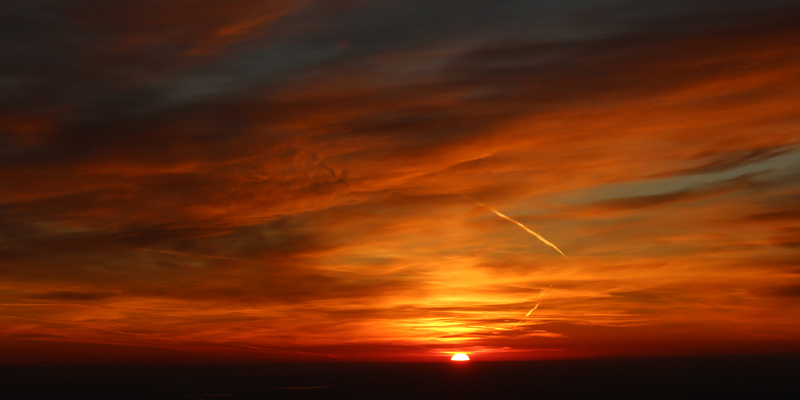 The sun makes its first appearance of the day on the horizon. It is the dawn of a new day in Idaho. Two roads diverge on the east face of Hayden Peak. 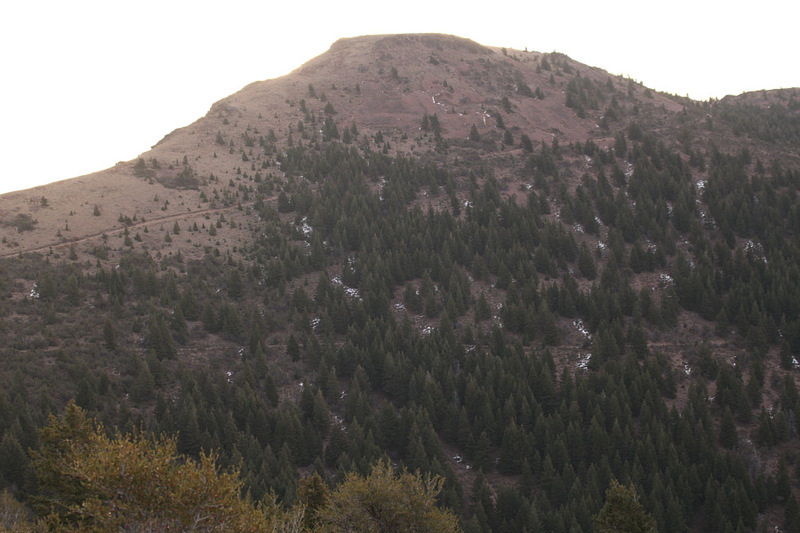 Here is another look at Hayden Peak (centre) from the north along the approach road. Zosia and I subsequently made a quick stop at an old cemetery before driving into Silver City which was at one time a thriving mining community during the late 1800s. 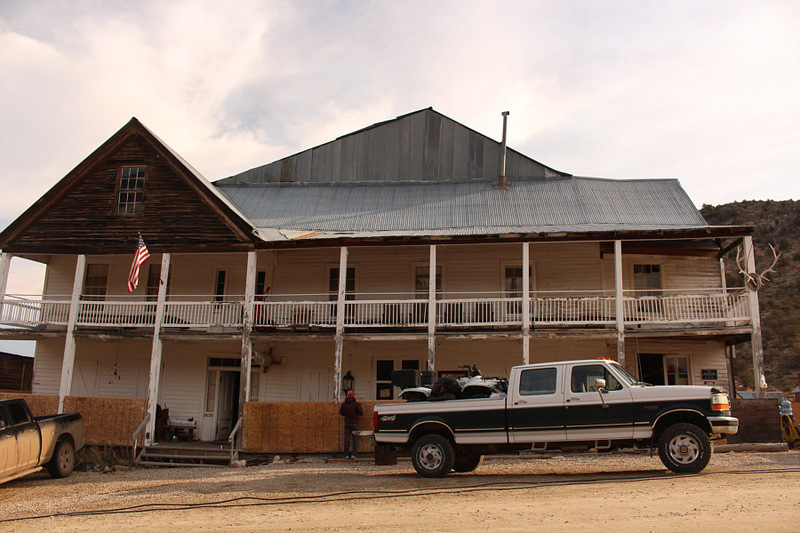 Following the eventual demise of mining operations, this one-time county seat slowly devolved into the ghost town that it is today. Perhaps because of its isolation, Silver City was spared the devastation--usually from fire--that befell many other ghost towns. Furthermore, the town was not completely abandoned and is still inhabited by a handful of seasonal residents. Despite the rustic exteriors, many of the buildings appeared to be well-maintained or were undergoing restoration. "No Trespassing" signs were everywhere. 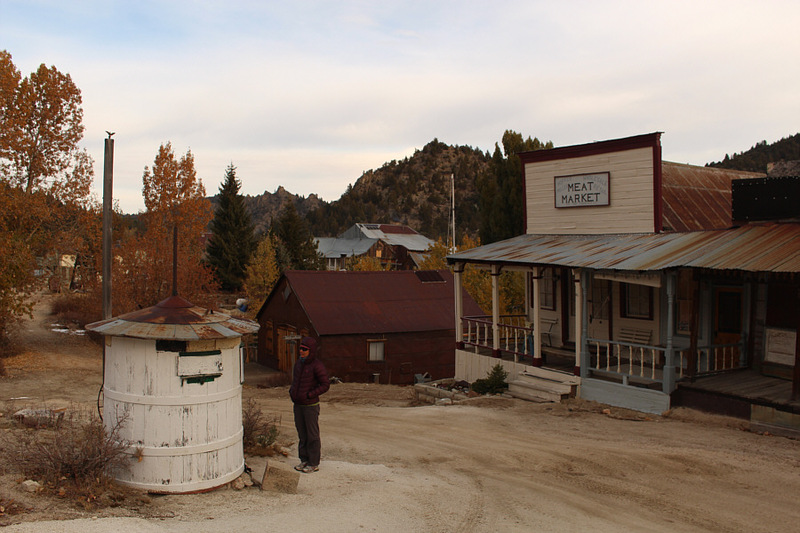 According to the proprietor of the town's lone hotel, Silver City actually receives a lot of visitors during the summer months as evidenced by the numerous public outhouses scattered throughout the town. The hotel had actually just closed for the season when Zosia and I arrived, but the proprietor still allowed us to go inside and visit the main dining parlour. After leaving the hotel, Zosia and I ate a quick lunch before driving out of the Owyhee Mountains. We had originally arrived from the west via Jordan Valley, Oregon, and the hotel proprietor advised us to leave the same way since she was concerned about possible ice and snow on the steeper eastern access via Highway 78 south of Murphy, Idaho. I was not nearly as worried especially after driving all the way up Hayden Peak earlier in the day. 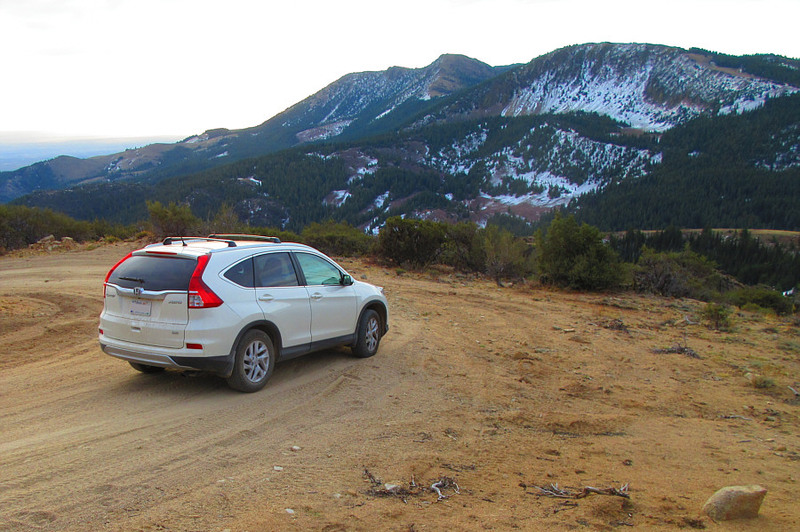 Since we had plenty of gas (by the way, there are no gas stations in Silver City), Zosia and I agreed to give the eastern access a try, and although there were some snow patches in some of the shadier sections of the road, we had no issues driving out that way. 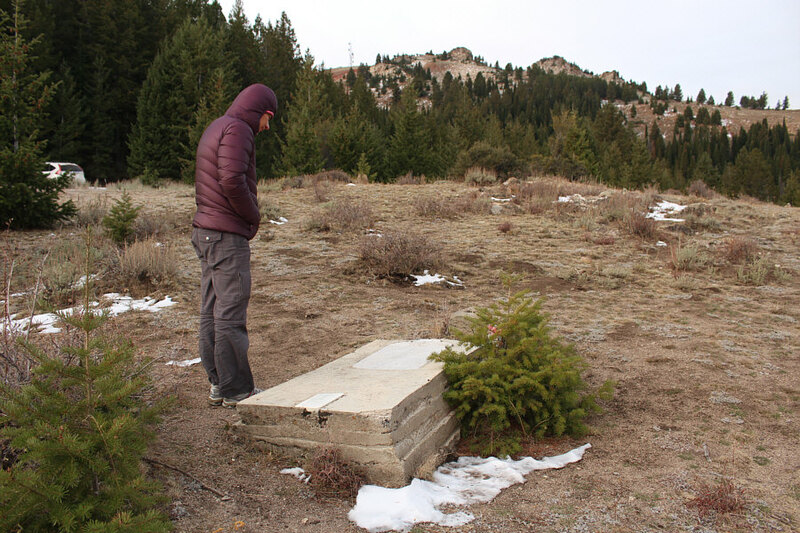 Zosia visits Fairview Cemetery which is located on the slopes of War Eagle Mountain (the summit antenna can be seen in the distance). There apparently used to be a town here, but most of the buildings were lost to fire. 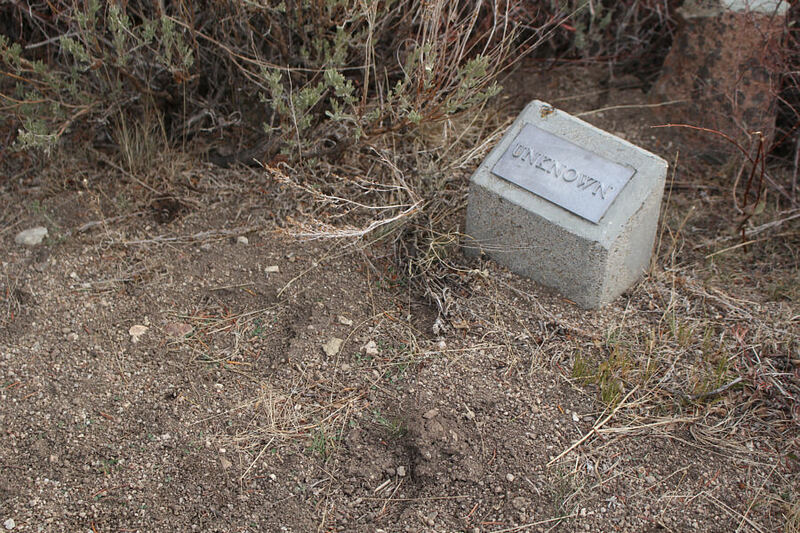 Most of the graves in Fairview Cemetery are unmarked like this one. 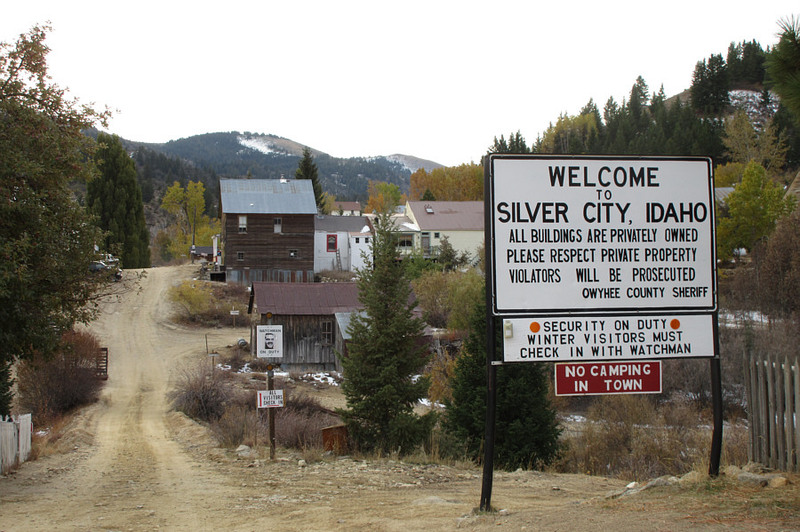 This is the entrance to Silver City. Zosia checks out a brewery vat on the street. This building actually straddles the creek running through the town. 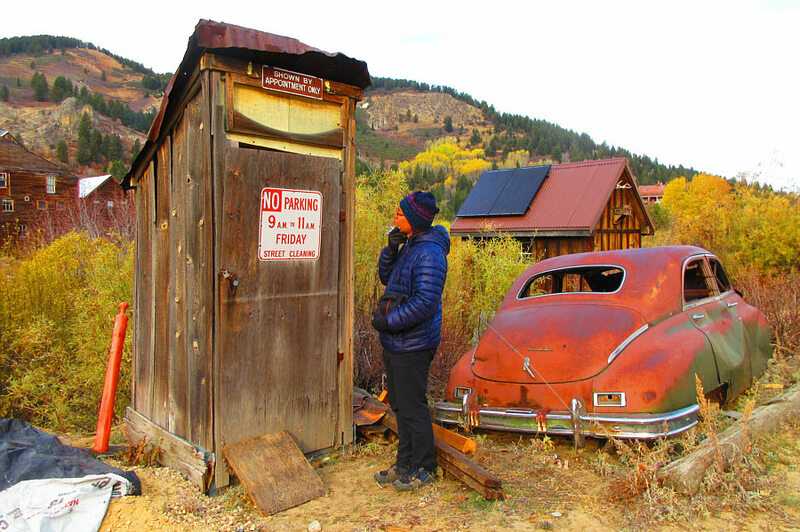 Sonny ponders the validity of the sign on this outhouse. 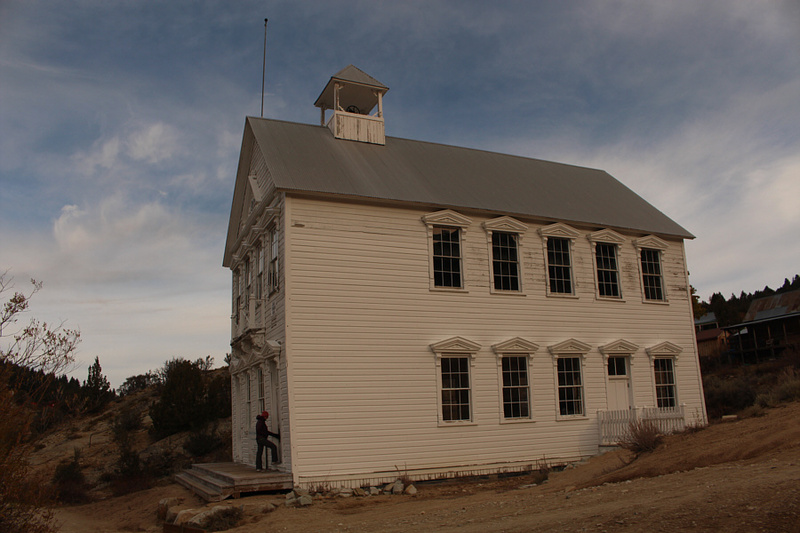 Being a teacher, Zosia is intrigued by the town's school house. The town's church is not handicap accessible. 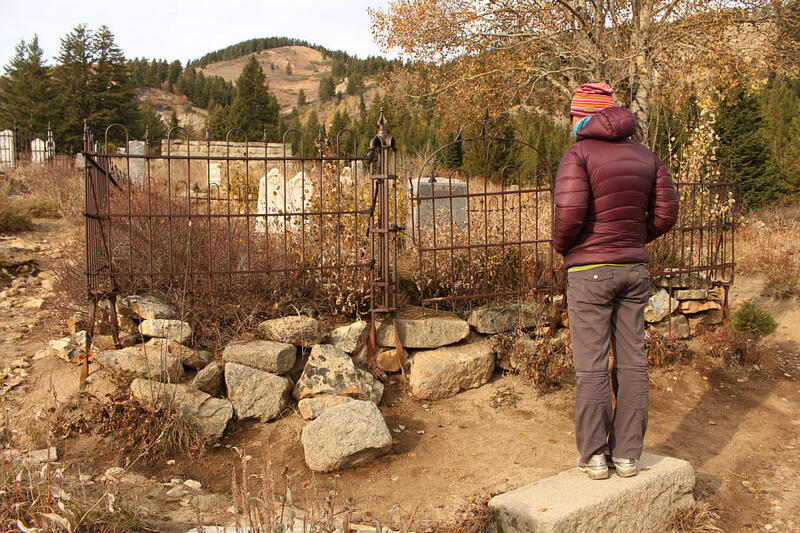 Zosia visits the Silver City cemetery. 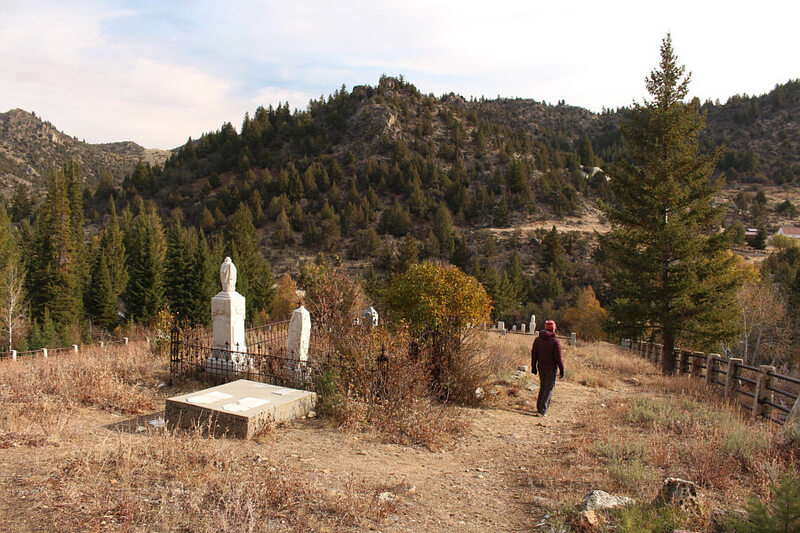 The Silver City cemetery overlooks Jordan Creek valley. 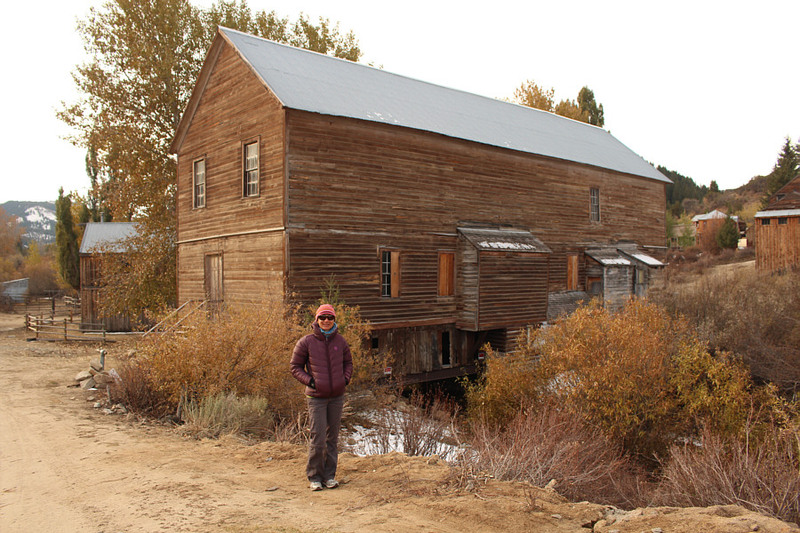 The Idaho Hotel has just closed for the season. 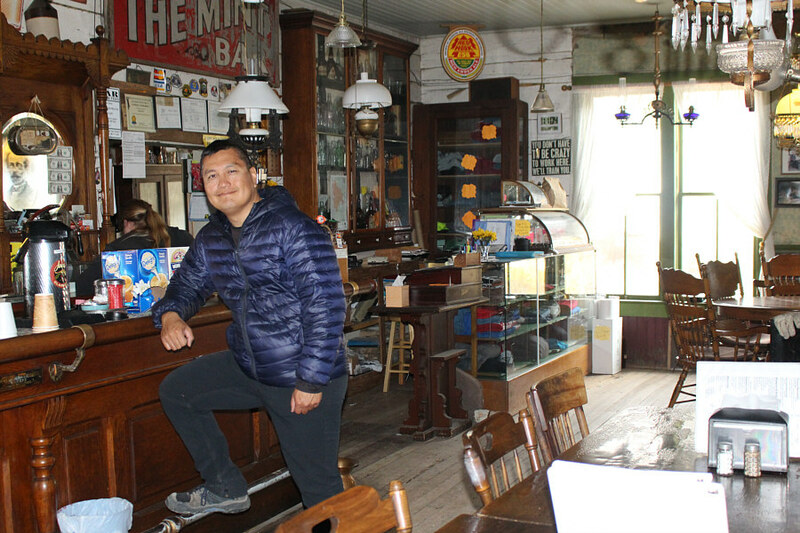 Sonny steps up to the bar in the dining parlour of the Idaho Hotel. 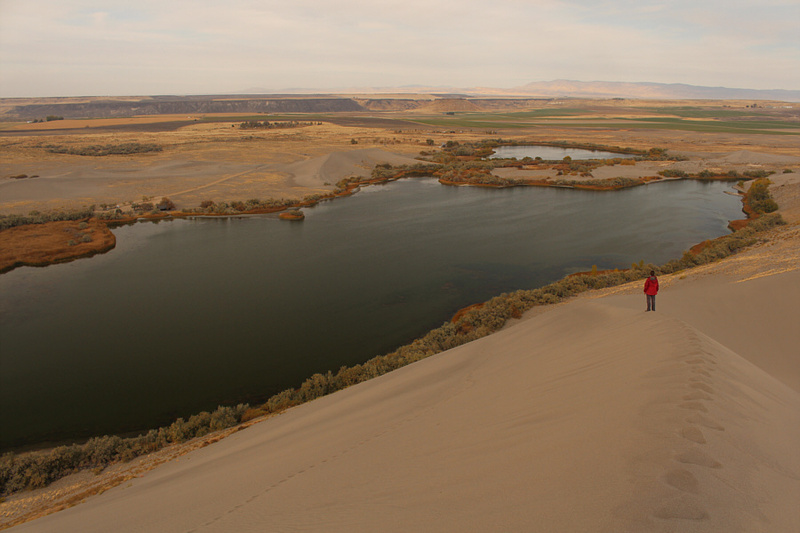 With a lot of daylight left, Zosia suggested visiting Bruneau Dunes State Park after spotting it on our Idaho highway map. The park is located just east of its namesake town near the junction of Highways 78 and 51. 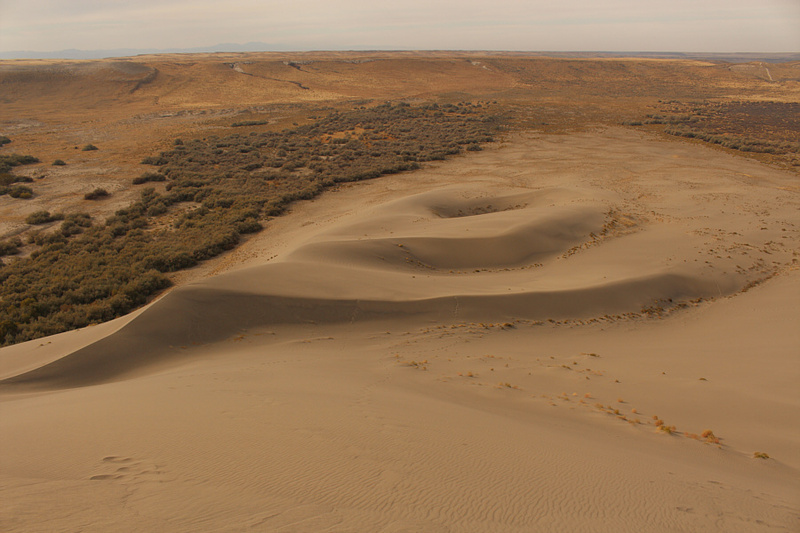 The main attraction is a large sand dune touted as "the tallest single-structured sand dune in North America" according to the park's website. After paying the vehicle entry fee ($5.00 USD) at an unmanned gate, we stopped briefly at the visitor information centre to pick up a map before driving to the park's centrally-located picnic area. 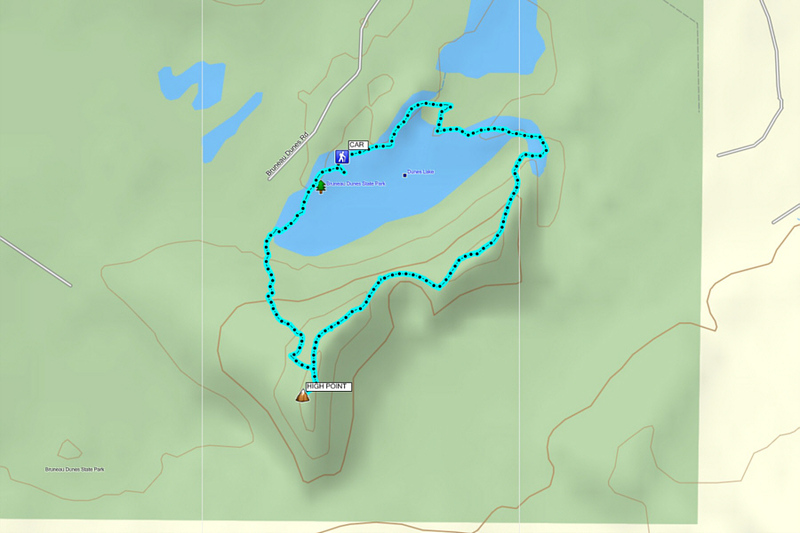 From there, we set off on foot and followed a designated trail past the "Big Lake" which sits at the base of the "Big Dune". 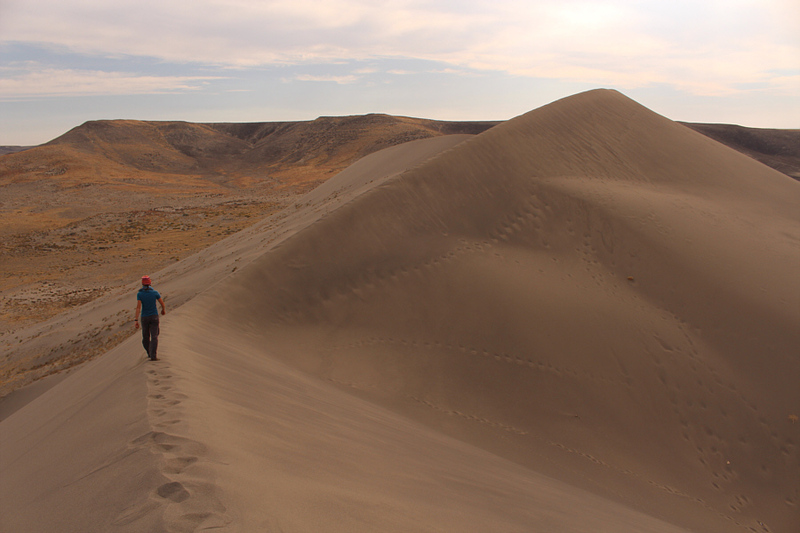 We then churned our way up to the high point of the Big Dune, a sandy endeavour which turned out to be more strenuous than expected. 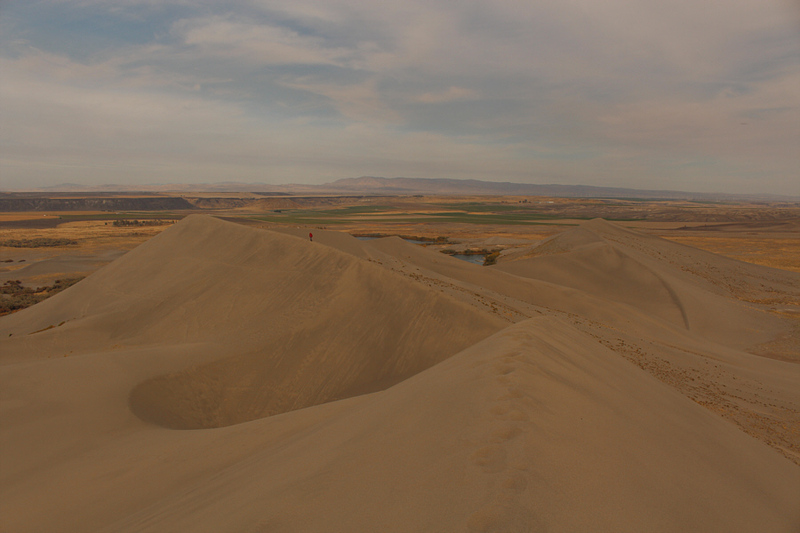 From the high point, we traversed along the crest of the Big Dune before dropping down its northeastern end to complete a circumnavigation of the Big Lake. Because of thick vegetation along the lakeshore, some bushwhacking and route-finding were required to get us back to our starting point. We concluded our visit by having dinner in the picnic area before driving out of the park. 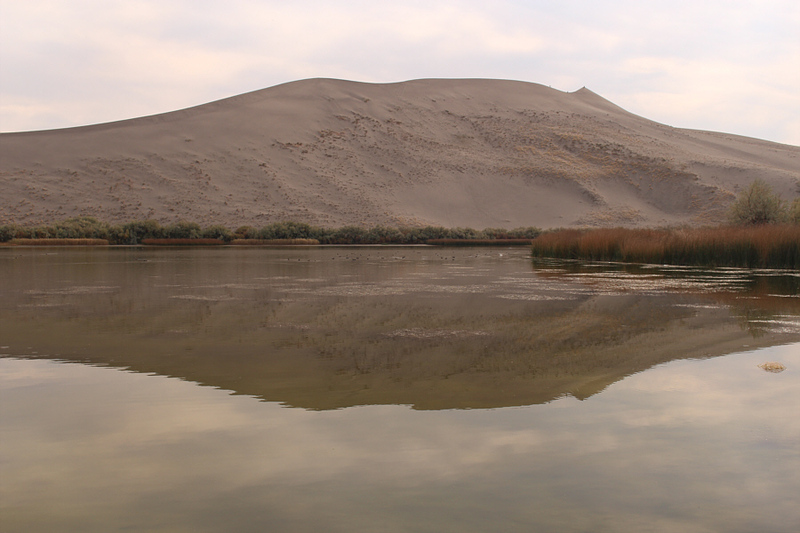 The Big Dune is reflected in the Big Lake. 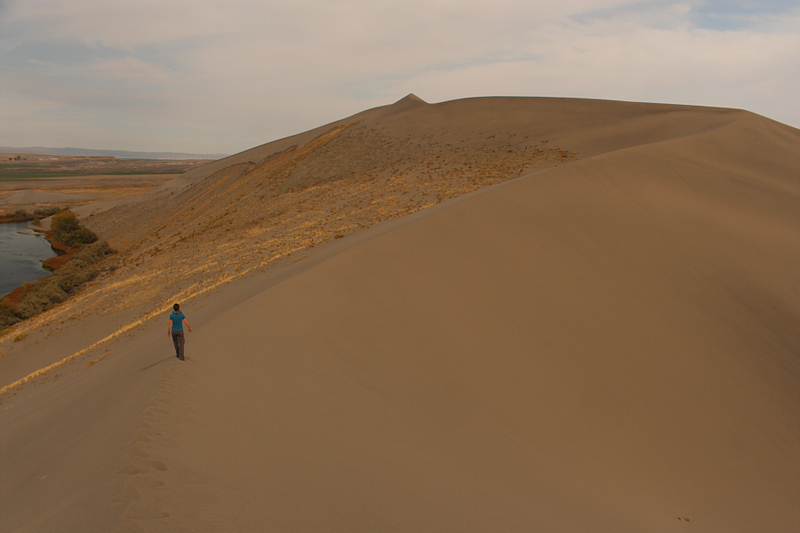 Note the hikers on the crest of the dune. 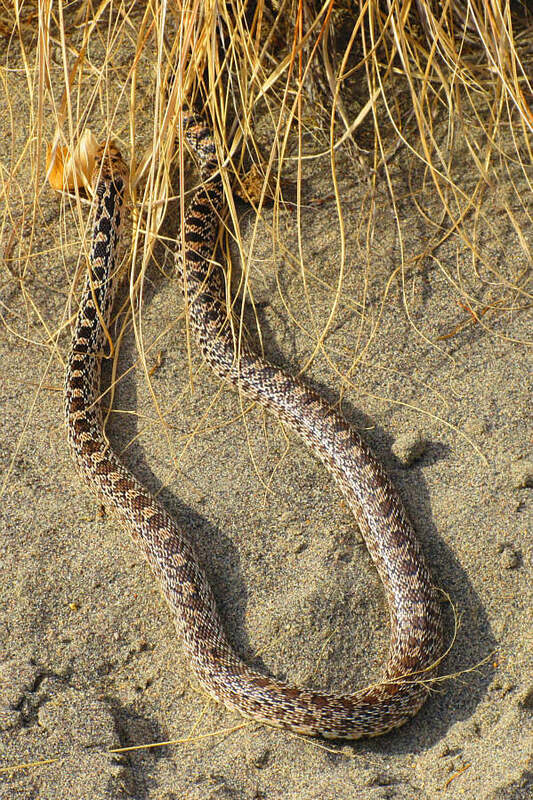 A gopher snake quickly retreats under a shrub after nearly being stepped on by Zosia. 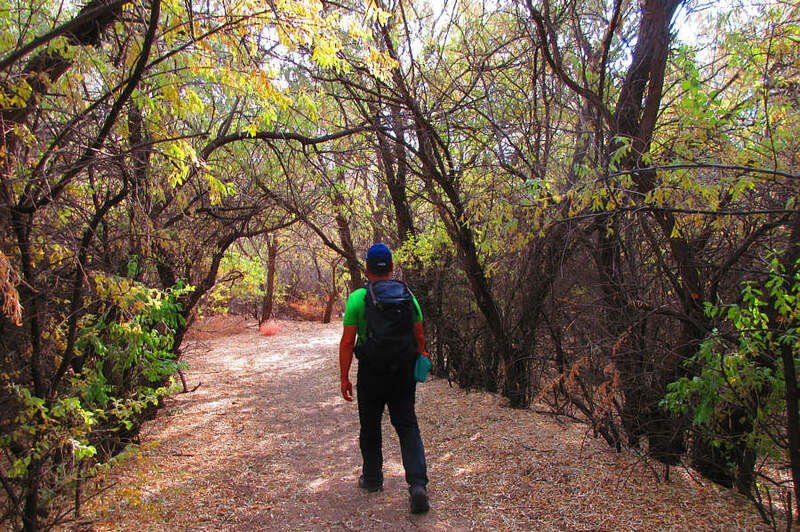 The designated trail goes through a short section of forest. Zosia climbs up the Big Dune. 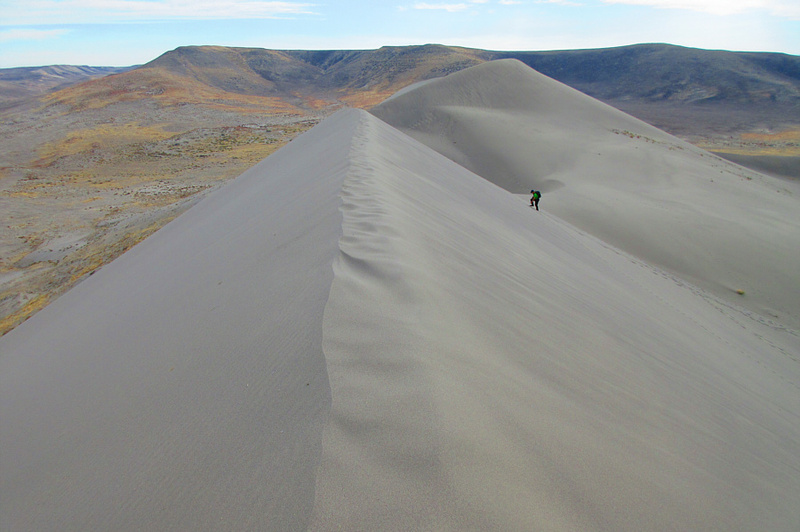 Sonny grinds his way up to the crest of the Big Dune. 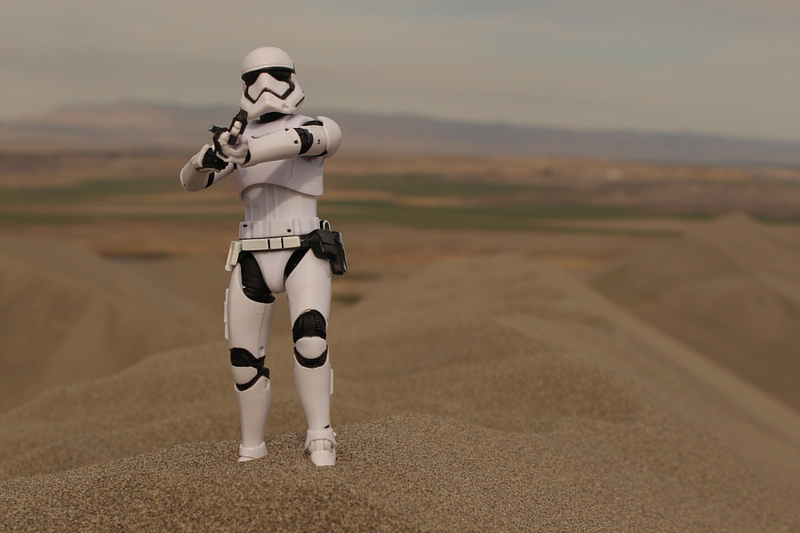 The high point is visible behind him. Zosia heads for the high point of the Big Dune. 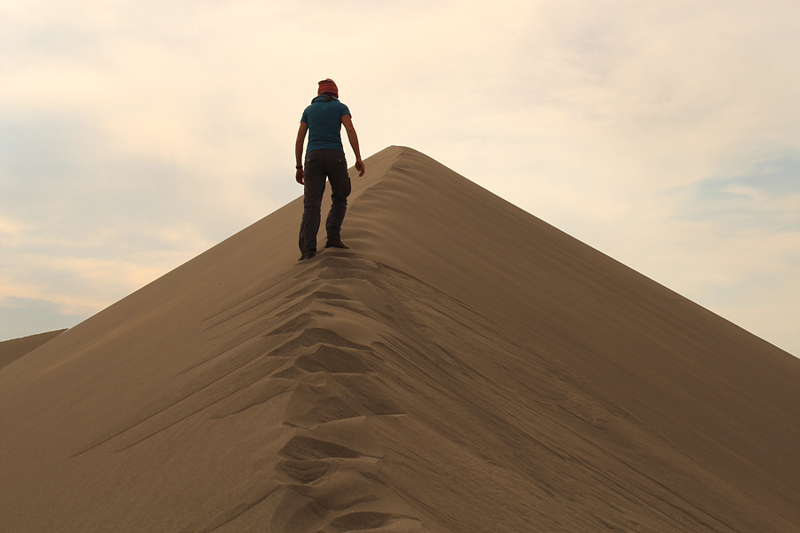 It is not easy to maintain balance while climbing up the crest of the sand dune. 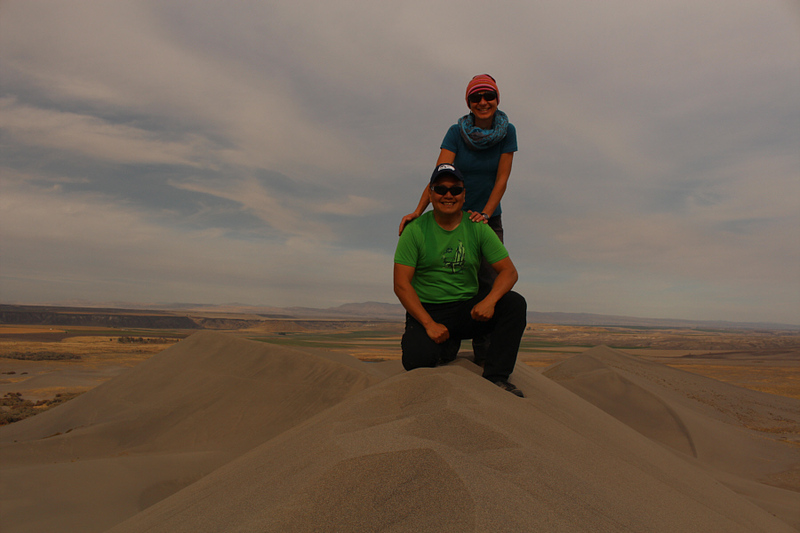 Sonny and Zosia reach the high point of the Big Dune (891 metres). 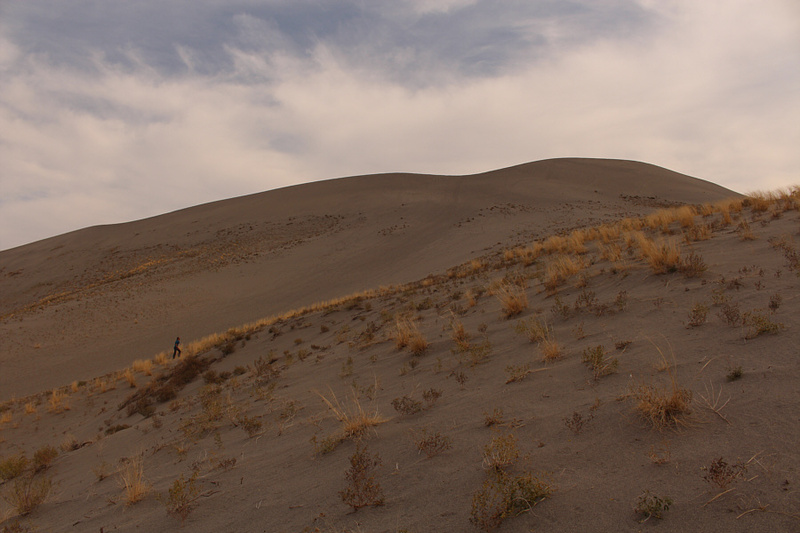 After leaving the high point, Zosia heads northeast along the crest of the Big Dune. Some smaller sand dunes lie to the west of the high point. Beyond the Big Lake are the Small Dune (left of centre) and the Small Lake. Zosia and Sonny would eventually return to the picnic area (far left) along the far shoreline of the Big Lake. Zosia continues hiking along the crest of the Big Dune. 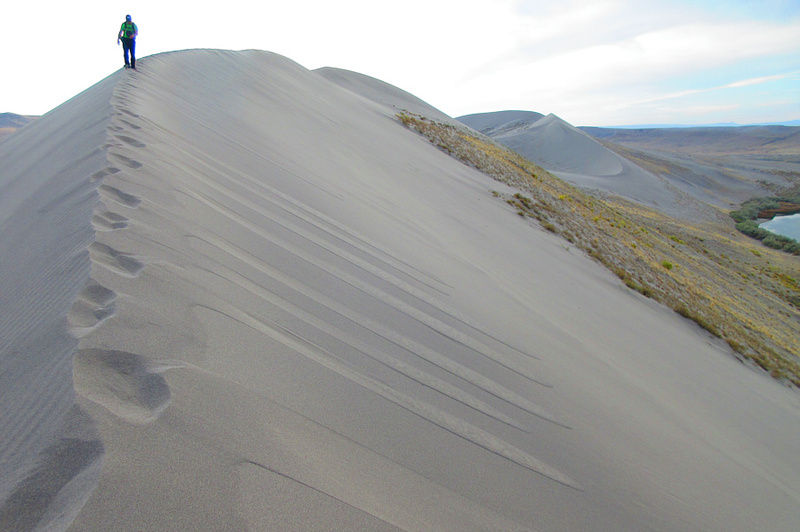 Small sand avalanches are created with each footstep along the crest of the dune. 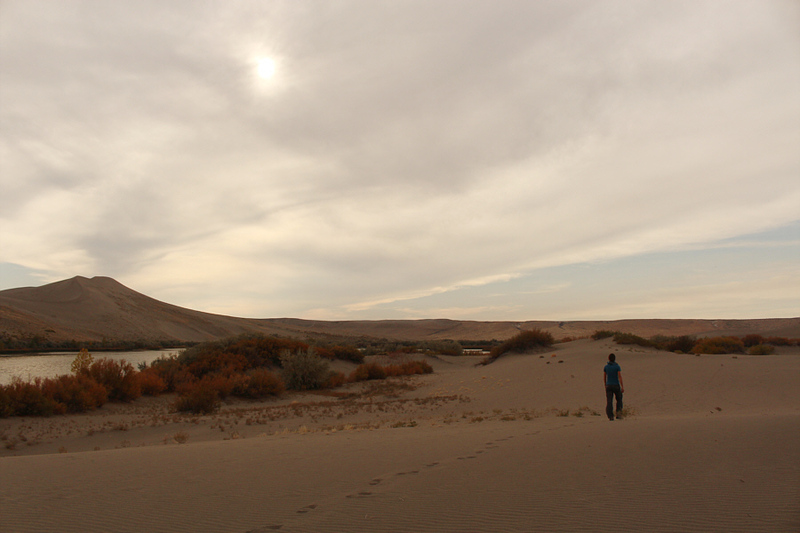 Zosia hikes back to the picnic area along the sandy flats north of the Big Lake.